Since 1832, when the first pioneer Redemptorists began working for souls in America, the Province has not only made history, it has accumulated a considerable stock of documents, images, and objects relating to the growth of the Catholic Church in the United States. The Archives is the repository for all of the Province records, parish histories (less sacramental records), and personnel files of Redemptorists who were, or are, part of the American mission. 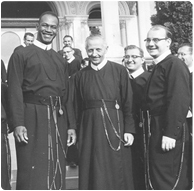 The collections provide a rich perspective on the ministries carried on by Redemptorist bishops, priests and brothers throughout the eastern states, as well as in the mission territories of the Caribbean islands, Paraguay, and Brazil. Click to listen to a podcast featuring archivist Patrick Hayes, Ph.D., discussing his new book, The Civil War Diary of Rev. James Sheeran, C.Ss.R. : Confederate Chaplain and Redemptorist. Click here to read more about the history of the Baltimore Province, the oldest in the United States. The Archives possess numerous collections, including the papers of St. John N. Neumann, the fourth bishop of Philadelphia, and Blessed Francis Xavier Seelos. Our holdings are particularly strong in matters relating to the immigrant experience of the 19th and 20th centuries. As sons of St. Alphonsus Liguori, Redemptorists are known for being especially adept in the field of moral theology, preaching missions, giving retreats and serving the most impoverished members of society. Their legacy demonstrates in manifold ways how they have shared in the struggles and joys of the people of God. The following files (PDF) have been prepared by archives staff to aid researchers in locating information within our archives. Please contact the archivist for information about accessing these resources. Blessed Francis X. Seelos, C.Ss.R. Bishop Ronald G. Connors, C.Ss.R. Archbishop William H. Gross, C.Ss.R. Bishop Edward J. Harper, C.Ss.R. Bishop William T. McCarty, C.Ss.R. Bishop James E. McManus, C.Ss.R. Bishop Bernard J. Nolker, C.Ss.R. Bishop Thomas F. Reilly, C.Ss.R. Bishop Aloysius J. Willinger, C.Ss.R. Rev. John A. Duffy, C.Ss.R. Rev. Louis F. Hartman, C.Ss.R. Rev. Francis X. Murphy, C.Ss.R. Hours: Monday through Friday, 9 a.m. to 5 p.m. Eastern Time. The archives are open to scholars and other qualified visitors by appointment. The Institute is a group of Redemptorists, collaborators, and researchers who promote the study of the Congregation of the Most Holy Redeemer in the North American context. We seek to develop and facilitate original historical research as well as to preserve, promote, and provide access to the treasures of the North American Redemptorist heritage.